Isiah Factor | The Insite » DID YOU JUST SAY YOU WANTED HELP FROM THE FEDERAL GOVERNMENT? DID YOU JUST SAY YOU WANTED HELP FROM THE FEDERAL GOVERNMENT? October 29, 2010 | Posted in Uncategorized | Comments Off on DID YOU JUST SAY YOU WANTED HELP FROM THE FEDERAL GOVERNMENT? One thing has been clear in 2010, it’s the frustration and anger Conservative groups like the Tea Party and King Street Patriots have when it comes to the federal government. 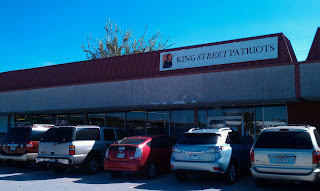 There are signs in the Houston offices of the King Street Patriots indicating government is too big and too intrusive. There are books lining shelves indicating a severe distrust of the feds. So, why is the King Street Patriots asking for help from the federal government now? The attorney representing the Conservative Houston organization says he’s sending a letter asking the federal government for help. What? They’re asking the U.S. Justice Department to come from Washington, D.C. and investigate allegations of voter intimidation and irregularities at the polls in Harris County for these hotly contested midterm elections in Texas. Members of the Patriots say some of their poll watchers in Houston have been victimized by those who were upset the volunteers were in their precincts. Calling in the federal government makes complete sense for voter irregularities by those who trust the government. But wouldn’t it be a complete contradiction to the facts we know about the Conservative position? They want less government involvement, less intrusion, states’ rights, and the ability to control their destiny on a local level. So with that in mind – why aren’t members of the Patriots asking the State Police or Texas Attorney General to investigate? Patriots attorney Jonathan Saenz was quoted as saying, “we realize it’s time for the federal Department of Justice to step in.” That’s what Conservatives said they were against or am I imagining things? I’d love to hear your opinion on this issue!